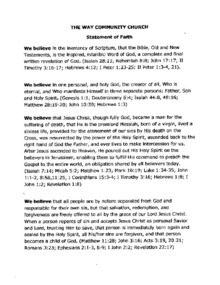 We believe in the inerrancy of Scripture, that the Bible, Old and New Testaments, is the inspired, infallible Word of God, a complete and final written revelation of God. (Isaiah 28:13; Nehemiah 8:8; John 17:17; II Timothy 3:16-17; Hebrews 4:12; I Peter 1:23-25; II Peter 1:3-4, 21). We reject doctrinal viewpoints or spiritual phenomena, which are based solely on experience or emotion. We look to the Word of God for the basis of all our faith and practice. We believe in a personal devil called Satan who, along with all his evil angels, called demons, is destined to spend eternity in hell, and who now seeks to deceive the believers and defeat the work of God, but who can be resisted by believers who are indwelt by the Holy Spirit, protected by God, and interceded for by Jesus our Lord. (Psalm 9:17; Matthew 5:3, 5:22, 18:9, 25:31-34; Mark 9:42-49; Luke 12:5; John 3:18; Hebrews 12:23; I Peter 1:4; Revelation 14:10-11, 20:11-15). We believe that the nation of Israel has a special place in God’s plan and that all the promises made by God to Israel will be fulfilled. * To read more about what The Way Community Church, check out Pastor Buddy Dockum's blog, "Just Saying".